In an imaginary Cisco world every device would be able to talk with every other device in various layers. In the actual Cisco world, some devices can talk to some devices, while they can't talk to some other devices. I'm talking specifically about L2 Control Protocols (L2CPs), when these need to be exchanged between different devices in order to support a requirement (i.e. create a spanning-tree loop). Cisco's L2 Protocol Tunneling (L2PT) can help in accomplishing some of these cases. So let's suppose you have a scenario like the following. When using the simplest form of devices (L2 switches like 3750), you can just tunnel the L2CPs between devices S1 and S2 and everything will be fine. 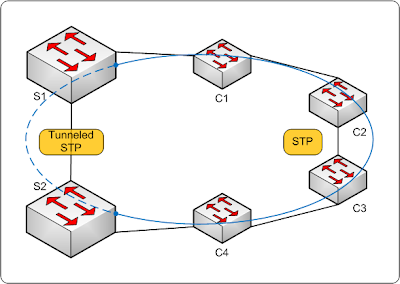 Spanning tree running on devices C1-C4 will see a loop and will block a port depending on various parameters (priority, cost, etc). As you move ahead and start to replace the S1 or S2 device with another (usually better), you realize that the new device supports a different way of handling L2CPs, which might be "incompatible" with the old way. Tunneling is quite common is scenarios like the above, where you need to pass the L2 frame across a L2 domain, without having the intermediate devices act upon it. You can also achieve the same result with forwarding, as long as you don't have a native L2 domain in between, because you might end up mixing local protocols with protocols that just pass over. It's obvious that you cannot have tunneling on one side and forwarding on the other side, because exchanged frames won't be able to "talk" each other. i.e. for STP one side will tunnel the frame by changing the destination mac address from 01-00-0c-cc-cc-cd (or 01-80-c2-00-00-00) to 01-00-0c-cd-cd-d0, while the other side will just forward the frame by keeping the original destination address of 01-00-0c-cc-cc-cd (or 01-80-c2-00-00-00). As you can see, you cannot have L2 communication between a service instance on a 7600/ES and one of the smaller platforms, because 7600/ES doesn't support tunneling and the smaller platforms do not support forwarding. Actually, the biggest surprise to me was the lack of support of L2PT on the 7600 with the ES cards when using service instances. I had the impression that this would be the most feature rich platform. Cisco's proposal is to use the same platform for such scenarios, because they haven't verified anything else and some platforms were built to be used in specific ways. So instead of supporting the same feature (L2PT was their idea after all) along the range of platforms, you should always replace them in pairs. And if by accident, you happen to have more S devices serving many overlapping rings, then you have to replace all of them. I would prefer, instead of promoting new platforms or new designs, to focus on fixing the existing platforms, so they can cooperate with each other. After all, if a platform is good enough, it will get its share in the market. Also, the online documentation is quite incomplete on this area. You have to guess what will happen in most cases. We had to open 3 different cases and involve our account team in order to clarify things and push for fixing the documentation. Not surprisingly enough, the peering functionality is another mess. I'll probably need to write another post describing all available options (which lead to different behavior) on these platforms. 1) "l2protocol forward" on ME-3800X will become available in the next major release. Thanks to Cisco for giving.us the chance to try it earlier. 2) This is the default behavior according to Xander's doc here. 3) Arie asked me to add some extra information about PW/MST/REP/PVST-AG (and all these L2 HA) scenarios. I'll try to write a new post as soon as i find enough free time to test them. This caught me on surprise. I had an impression that IOS-XR as an advanced operating system would support all kinds of multi-protocol transferability over BGP. As it seems, there is an issue when transferring IPv6 prefixes over an IPv4 peering or IPv4 prefixes over an IPv6 peering. This happens for sure on ASR9k running latest 4.1.0, but i haven't verified it on the CRS yet. This doesn't seem to be supported based on the available configuration options. What is even more worrying, is that no other address family is supported too. This is supported according to the configuration options, but it doesn't work. Cisco also insists that this is definitely supported. As soon as you enable the IPv6 address family under the IPv4 neighbor, the BGP session is dropped and it never comes up. Also, debug shows that there are no tries of BGP to establish a session. It's like BGP gets disabled. A given address family is only supported with a neighbor whose address is from that address family. For instance, IPv4 neighbors support IPv4 unicast and multicast address families, and IPv6 neighbors support IPv6 unicast and multicast address families. However, you cannot exchange IPv6 routing information with an IPv4 neighbor and vice versa. Two IPv6 prefixes are learned from the IPv4 neighbor. Next-hop is an IPv6 address. * i2001::1:2:3/128    2003::1:2:3              0    100      0 ? * i2003::/64          2003::1:2:3              0    100      0 ? If i remove the IPv6 address from the interface that is being used as next-hop (the one i added before), then i automatically get an IPv6 prefix with an IPv4 next-hop!!! *>i2001::1:2:3/128    10.11.254.41             0    100      0 ? The BGP session stays up, until something happens that will reset it. Then it will stay down forever, as it was happening in the beginning. I must say that i cannot endorse such an implementation. Using exactly the same configuration, you get different results, depending on the order of (un)configuring things. Also, i cannot understand why the establishment of an IPv4 BGP session that is going to negotiate IPv4/IPv6 address-family capabilities should depend on whether an IPv6 next-hop exists or not. That should be left for the NLRI exchange routine. If the NEXT_HOP attribute field is syntactically incorrect, then the Error Subcode MUST be set to Invalid NEXT_HOP Attribute. The Data field MUST contain the incorrect attribute (type, length, and value). Syntactic correctness means that the NEXT_HOP attribute represents a valid IP host address. If the NEXT_HOP attribute is semantically incorrect, the error SHOULD be logged, and the route SHOULD be ignored. In this case, a NOTIFICATION message SHOULD NOT be sent, and the connection SHOULD NOT be closed. Cisco agreed (thx Xander) that the behavior in 3 and 5 contradict each other, so a short-term solution (update the documentation and print a warning message) got recorded in CSCtq26829.